In 36 hours, you can go diving, visit islands and try the amazing local cuisine. Regularly named one of the most beautiful beaches in the world, Nha Trang in Vietnam's central coast has become a familiar destination for both local and international travelers. 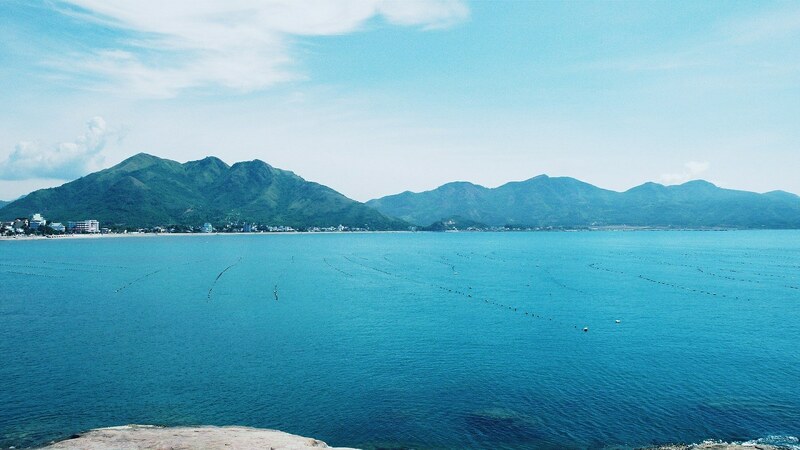 Here are a few suggestions on how you can fully experience Nha Trang in 36 hours. Floating around on the ocean for a long time at night could make people, especially first-timers, nervous. However, squid fishing can be a memorable experience. Fishermen often use plastic shrimps as bait to catch squid at night. The bait is designed to look like a real shrimp, with a hook attached to the tail. When the squid nibble at the bait, their tentacles get tangled in the hook. Each line has two to four sets of bait attached. You should drop the lines not more than 10m deep since it is easier to catch squids at moderate depths. You also need to jerk the line constantly so the shrimp bait can look like it is moving. Nha Trang has many squid fishing vessels you can choose from. Normally, they depart at 16:00 – 17:00, but the best time to go squid fishing is 18:00 onwards, since the creatures are easier to catch in the dark of the night. Therefore, you should negotiate with the vessel owner to go at the right time for the best result. The price of a squid fishing tour starts at VND400,000 ($17.19). Each tour operator has their own schedule: Some might add a coral diving experience before leaving for the fishing spot. 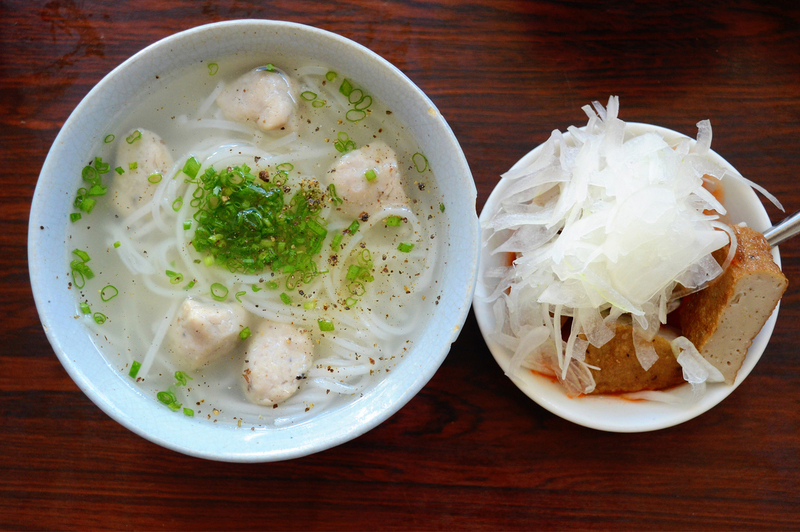 Ms Thua’s tapioca rice noodles soup, sold for the last 20 years on Yersin Street, is renowned for its deliciousness. People who visit the restaurant, both locals and visitors, are usually fulsome in their praise of the food here. What people find most interesting here are the noodles, which are unlike anywhere else. The noodles are as small as the Nam Vang rice noodles. They are cooked until they expand and have the right level of chewiness. The quantity of noodles in the bowl is adjusted to fit the person’s demand. The fish-based broth has a very light, fresh flavor and amazing aroma. The fish cake is made from fresh fish and so it is soft and chewy at the same time. This is also the unique feature of fish cakes in Nha Trang. You can add some lime and fish sauce with chilies to add even more flavor to the dish. The highlight at this restaurant is that the dish is served with a plate of pickled onions and fish sauce with chilies. 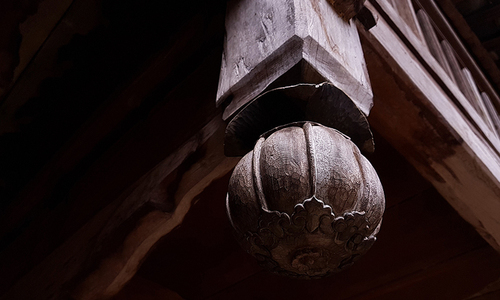 The place is not too big and is usually crowded, meaning it can get a bit stuffy inside. The service is quick, but if you go during peak hours, you will probably have to wait a bit. The restaurant remains open from dawn to around 10:00 or until the noodles run out. The price of a standard bowl is VND15,000 (64 cents) and it’ll be an extra VND5,000 if you want to add fish cake. A tour in Nha Trang often includes four islands, usually Tri Nguyen, Hon Mun, Hon Mot, and Hon Tam. Departure is at 8:00 and you will return at 16:00 -17:00. 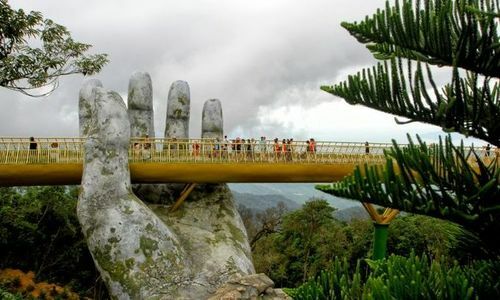 The price of this tour is VND150,000 – VND200,000 ($6.50-$9.00). There are extra entrance fees at the islands. The ticket prices vary between VND30,000 and VND90,000 ($1.30-$3.90). Hon Tam Island: sightseeing, photo opportunities. Tri Nguyen Island: you will get to see many colorful marine fishes in the aquarium here. 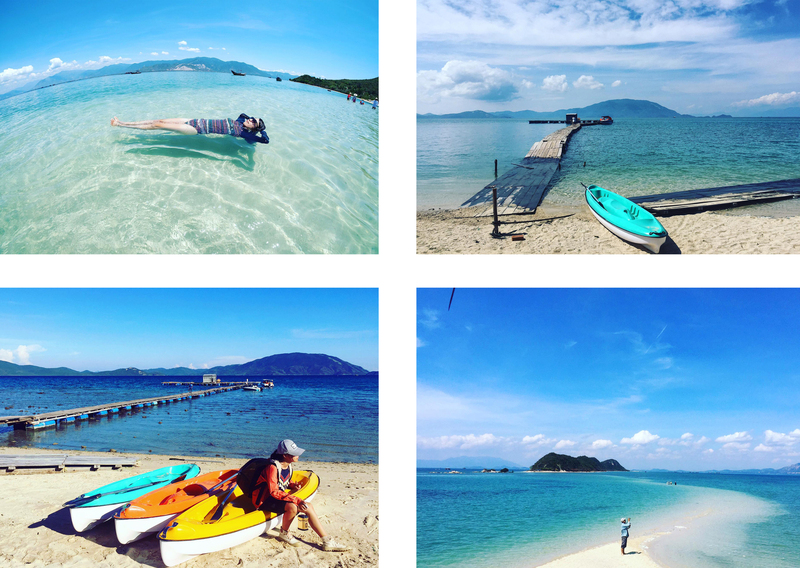 Hon Mun Island: see the beautiful coral reefs and fishes by either snorkeling/ diving or going around in a glass-bottom boat (paid separately). You are free to swim in the ocean. 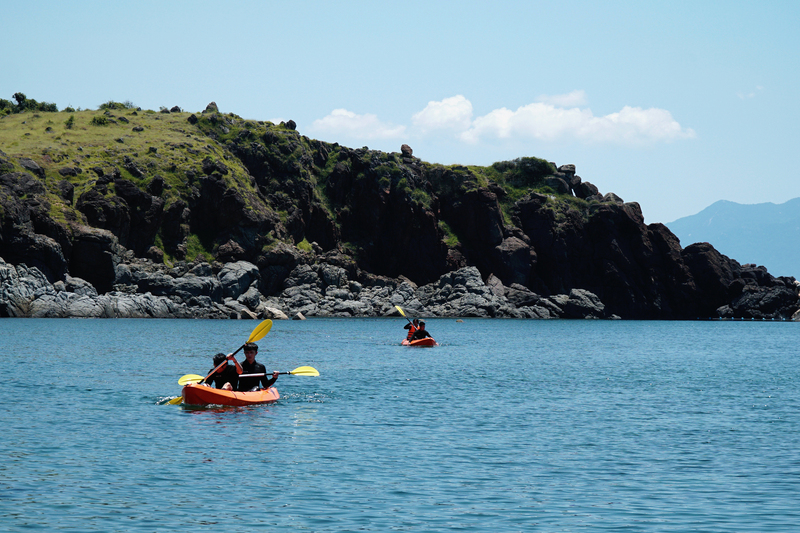 Hon Mot Island: you can try some adrenaline – inducing activities like parasailing, motor boat, diving, and kayaking. You can also rent 4-seat boats to explore the island by yourself. You can get information at the hotel concierge desk or ask travel companies directly. The price for a boat is around VND500,000 per day ($21.50) (island entrance fees not included). Since most activities will be outdoor, do not forget to take sun-protection gear such as hat, sunscreen, shades, and drinking water. You should wear comfortable clothes that allow you to move freely. Swimwear is essential. And don’t take fancy shoes. Thap Ba is a small street in the center of Nha Trang. Many young people call it a “food paradise” since it is filled with restaurants selling fresh seafood including lobster and crab, as well as cheap and delicious familiar Vietnamese foods like the crispy Vietnamese pancake banh xeo and steamed rice rolls banh cuon. If you want to eat some snail, you can visit Xuan Restaurant or Oc Huong 85KB restaurant. If you want to eat seafood, you should visit Gio Bien Restaurant, where creatures are caught and cooked fresh upon your order. Beside seafood, visitors can also try some local foods. 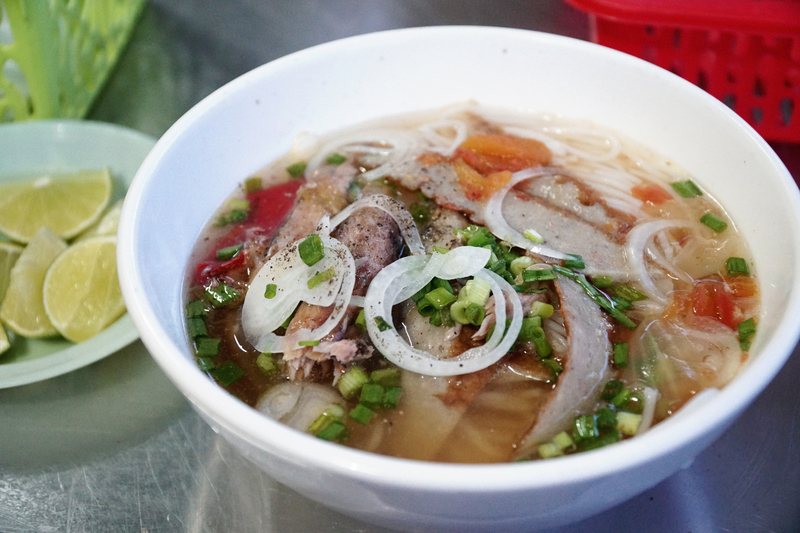 Some of Nha Trang’s signature dishes are tapioca rice noodles, mini grilled pancakes banh can the local takes on Vietnam’s famous noodles soup pho. Enjoy a nice cup of coffee while watching the world go by is also an experience preferred by many people. Opposite with Iced Coffee, which is famous for being a spacious place with modern style, 4A Villa attracts its customers with its classic Western-inspired design and light color. You can go to cafés along the beach if you want to breathe in some ocean air while sipping your coffee. 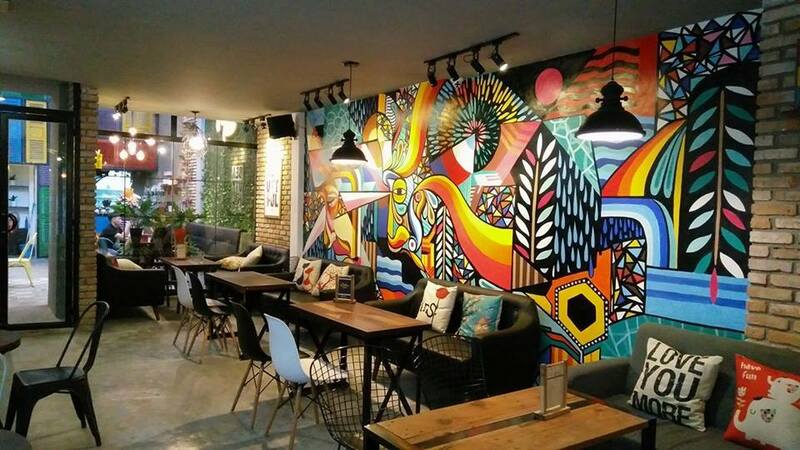 Just like Saigon or Hanoi, Nha Trang has many places where you can have a cocktail and move along catchy music. 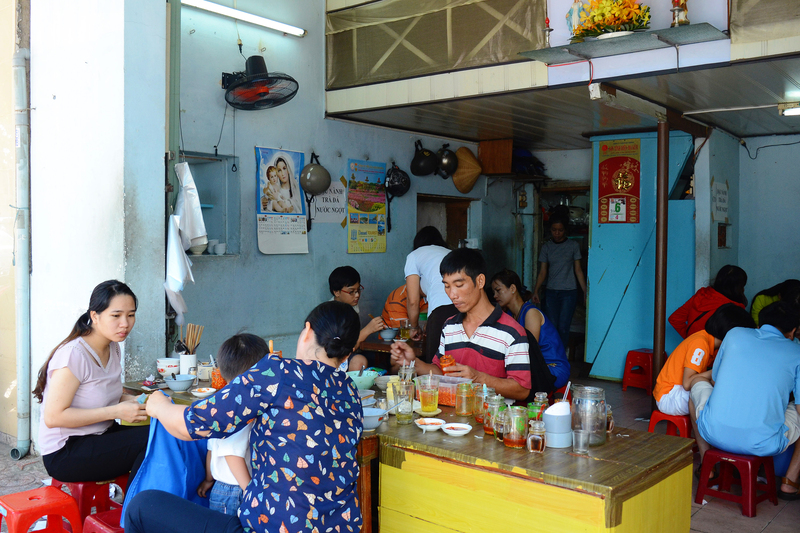 Try the oldest bar in the city on Tran Phu Street. It attracts many visitors thanks to its luxurious design inspired by architecture from Asia and the Mediterranean. The service here is very professional. There are also many other bars along Tran Phu Street. This dish consists of rice vermicelli in a special broth and boneless fish. 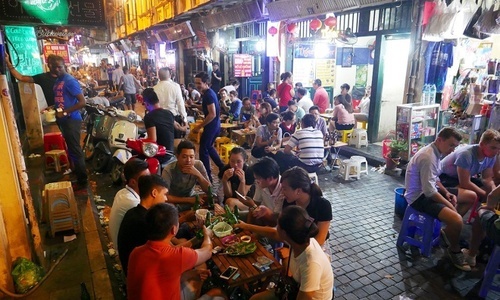 The original recipe of the rice vermicelli noodles soup came from Thanh My Village in Ninh Hoa town, 33 kilometers (20 miles) to the north of Nha Trang. The rice vermicelli noodles are swirled into a thin, round slice as small as the top of a bowl and each slice is then put on a piece of banana leaf to prevent them from sticking to each other. The broth is cooked with fish that is rich in protein and has sweet and tough meat, like fighting fish, queenfish, unicorn leatherjacket fish, or tuna. The fish chosen must be fresh. Before cooking, they are deboned and cut into medium-sized pieces. Nowadays people also add jellyfish or fried fish cake for more flavor. The noodles are soft, the broth is clear and does not smell of fish. Diep Son Island is in Van Phong Bay, about an hour by boat from the mainland. The place is famous for its pristine beauty and the sandbar connecting the islands. From Nha Trang, ask for the way to Van Gia Village, Van Ninh District, more than an hour north of Nha Trang. From Van Gia, you can go along Tran Hung Dao Street to reach the wharf. Normally, boats operate during the day, with the last trip at 15:00. If you’re going to Diep Son from the pier, you will have to depend on other local passengers. 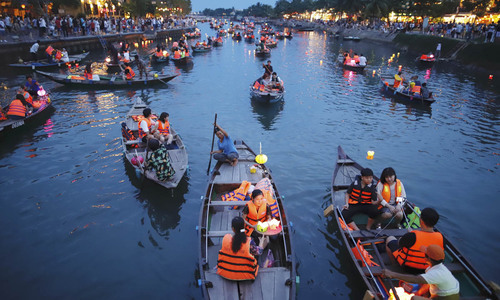 You can pay around VND500,000 ($21.50) for a private boat, which will have a capacity of seven to eight people. Since Van Phong Bay has strong waves and the island is quite far from the mainland, boats usually leave for the island in the morning so that they can return by noon or a bit after that. After getting off the boat, you can start your journey along the sandbars connecting the islands. They are about 700m long and 1m wide. There are some 80 families living on the island, mainly working as fishermen. Every day they are only allowed to use electricity for 3 hours. Diep Son Island is still very pristine and the tourism industry has not developed yet, so there are no hotels or motels. Remember to take enough food and water with you on the trip.